In the course of my travels and editorial research, I talk to a lot of folks regarding access. Some folks really get it, while others are clueless. I’m glad to report that the former was the case today at Historic Pensacola Village in Pensacola, Florida. At first glance I thought this attraction would be a total disaster for my readers, as I saw steps leading up to several buildings. But after talking with Associate Director Robert Overton, I came away with an entirely different impression. 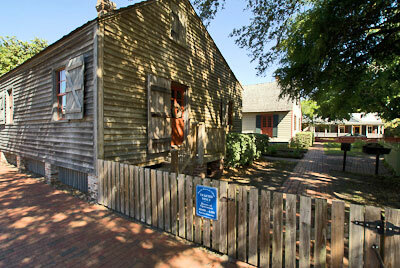 Basically the village is a group of historical buildings near downtown Pensacola. And although historic and accessible can be mutually exclusive terms, in this case I’m glad to report that’s not the case. Although a good number of buildings can only be accessed by steps, the two large museums, and most of the pathways throughout the village are accessible. Additionally, so is Christ Church, the Pfeiffer House and most of the stops on the Colonial Archeological Trail. But that’s not to say they’re throwing in the towel on access, as many access upgrades are planned for the future. In fact, every time they upgrade or renovate an existing structure, accessibility will also be considered. And Mr. Overton promised to keep me posted on their progress, so stay tuned!! Kudos to the Historic Pensacola Village for having the right attitude about access! This entry was posted in Attractions, Attractions, Discounts & Freebies, Editorial, Museums, Road Trips and tagged accessible travel, attractions, barrier-free, disabled travel, florida, historic pensacola village, museum, Pensacola, wheelchair travel by Candy B. Harrington. Bookmark the permalink.